4 out of 5 rating. 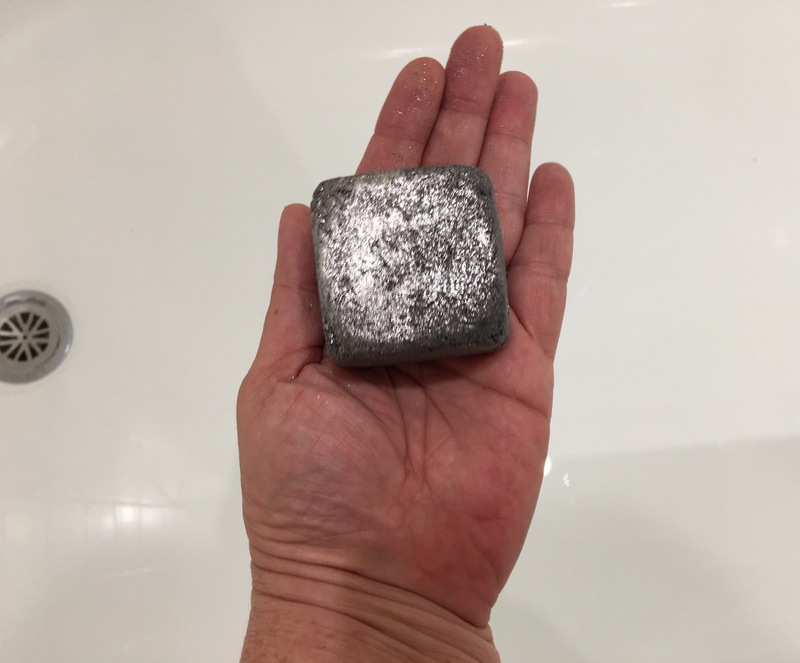 Made with the Ectoplasm bath bomb fragrance of tangeeine, grapefruit and litsea cubeba.. see my tub demo below. 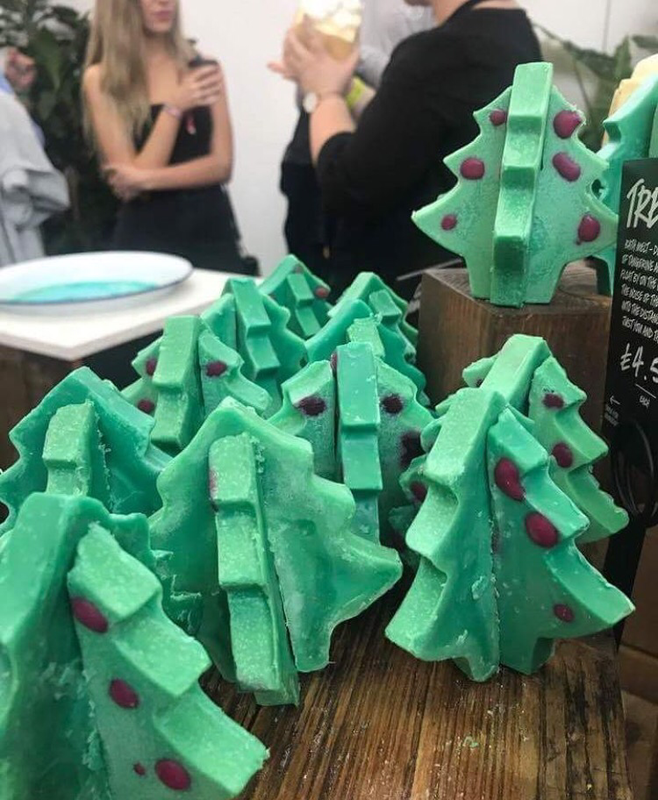 I love that this is a 3D bath melt of a tree. Thus the name ‘Tree D’. We can use one piece or both pieces for one bath. I’m full on addicted to this citrussy scent. This has a nice somewhat sweet, spicy fennel scent. 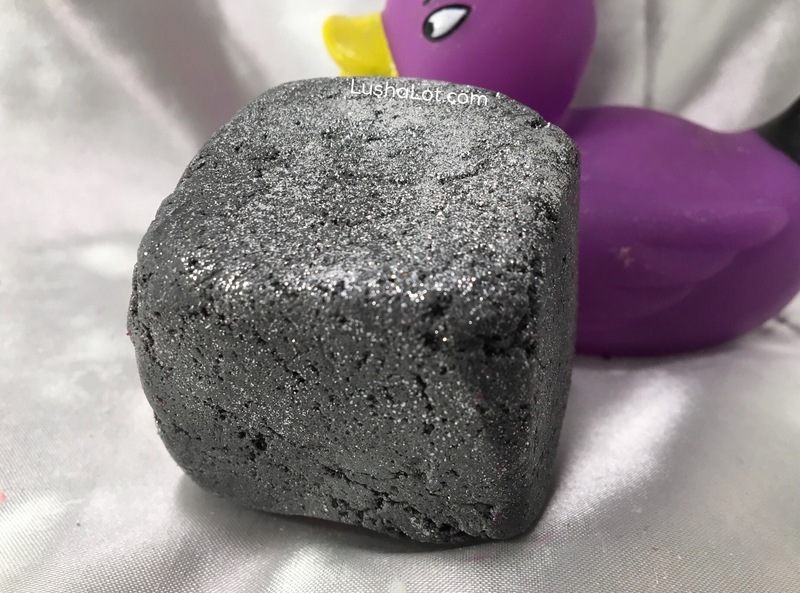 It’s dark gray close to black, and it has silver lustre and it adds silver sparkle to the grayish water. It’s nice to have once in a while. A fabulous way to get a good amount of our favorite fragrances in a small package. It’s small but it makes a gorgeous show in the tub. Adding color and in some cases shimmer. The fragrances are stronger and last longer on the skin than in other things like bath bombs and bubble baths. I have all of them, so as i use each one i’ll make videos and take photos that you can watch via the links below. Here’s a 15 second video i made showing as many of these as i could. I keep them in a bowl in my bathroom. 5 out of 5 rating. See my demo video below. 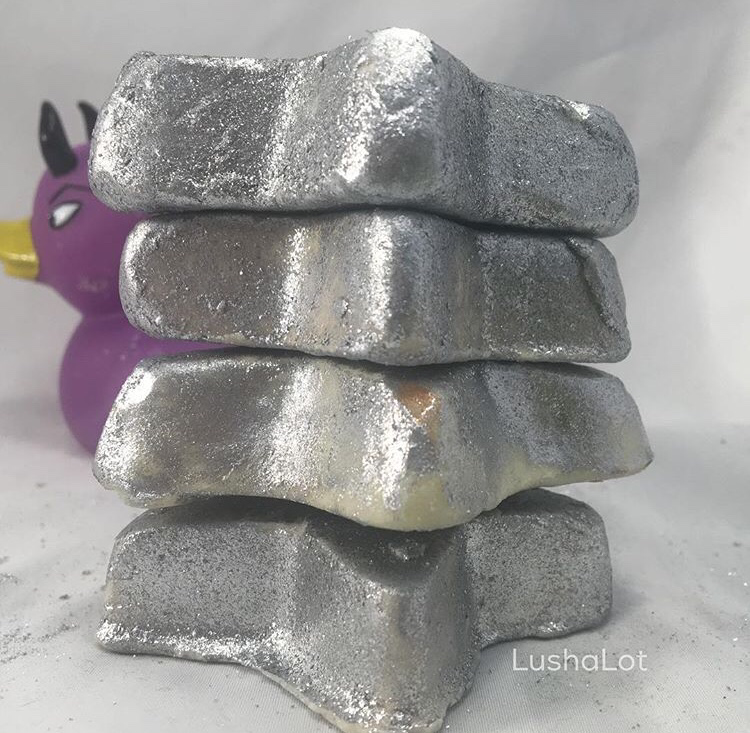 One of only three or four lush products ever, that are all silver. This has lime and ginger, so it smells bright. And the silver shimmer in the water is awesome. 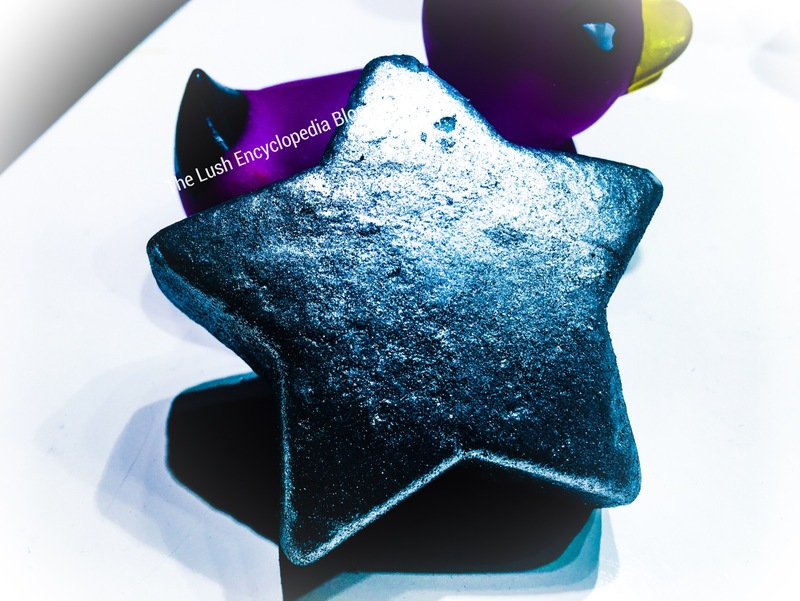 Description: Catch a falling star and put it in your… bath. 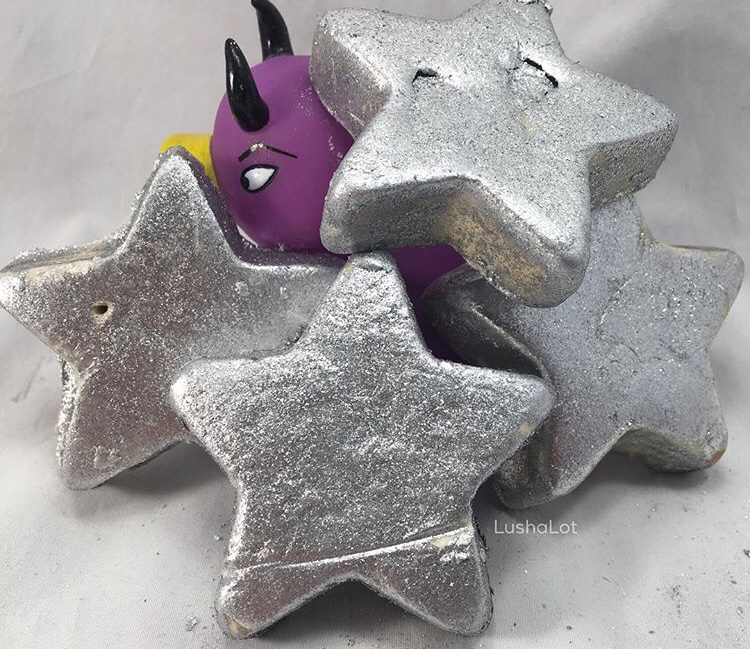 We have been working for a long time to make this Christmas bath melt – a shimmering bright star for an extra special bath filled with light and lustre. 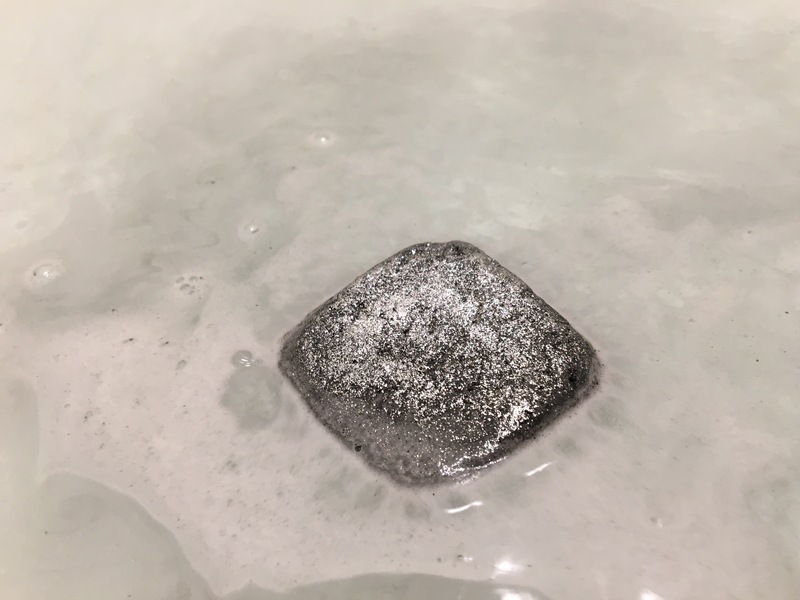 The shea butter fondant centre inside this bath melt is rich and moisturising, creating a soft and creamy bath. 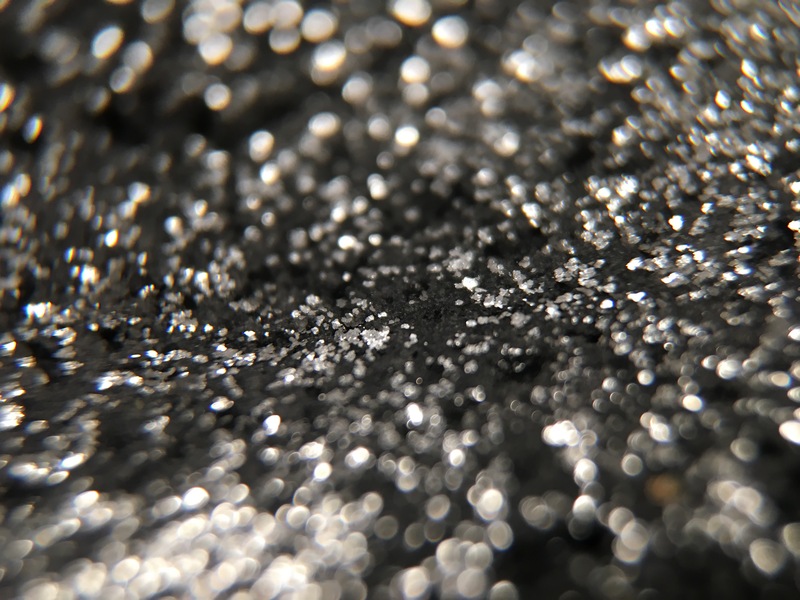 When the star melts, its silvery lustre spreads into the water creating a magical trail of starlight. Refreshing ginger and zesty lime oil inspire positivity and will also give you an extra boost. Close your eyes, make a wish, crush this melt under running water and watch as your bath turns into a turquoise, silvery pool of star light. See my demo video below. It has a great apple scent! We don’t want to put ideas in your head, so we’ll just plant a seed. Why not pop this fruity green treat in the bath? An apple a day will send troubles away as you sow uplifting neroli, bright lemon and Brazilian orange oils into the water. Make it the apple of your eye. Made with the fragrance of their past ‘Orange Blossom’ perfume. Lush Description: Get on your bike and cycle through sun-dappled orange groves. Oh wait, you’re in the bath? Well, you’ll have to soak in the next best thing instead. Bursting with organic shea butter from the Ojoba Women’s Shea Co-operative in Ghana and sultry rosewood oil, it’s not hard to imagine you’re bathing in sunnier climes! From the title of a Ray Bradbury novel/screenplay/movie. Ingredients: Cocoa Butter, Almond Oil, Perfume, Ginger Oil, Jasmine Absolute, Oakmoss Absolute. Review: Having a real ginger root scent, and not that of Gingerbread. The ginger is softened by lovely Jasmine and almond oil. This is a good blend of ginger and jasmine. The oakmoss lending that “spooky’ quality from the store of the same name. 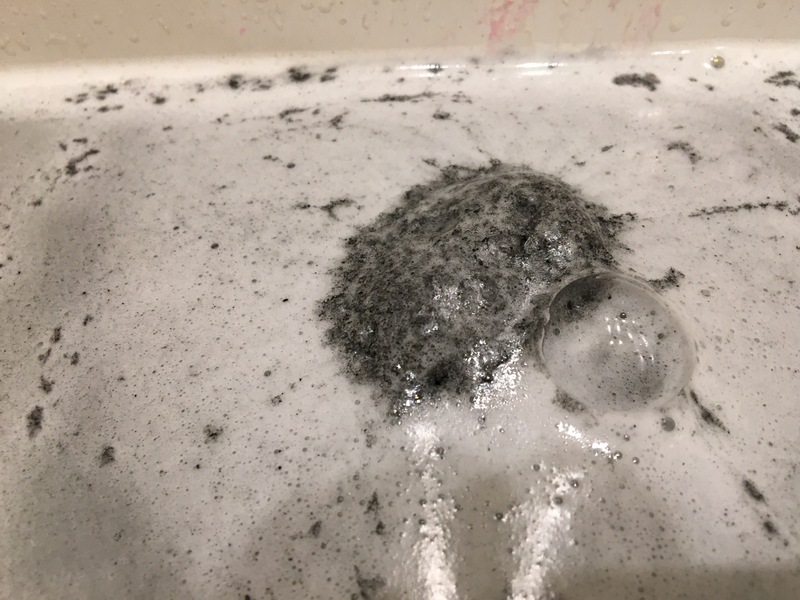 If it’s a fresh Something Wicked bathmelt you can smell the layers of scent, pretty floral, earthy oakmoss, spicy ginger. That said, i wish there were more scent. I’ve had a few that were stronger and the scent was very nice. But the weaker scented melts have to be brought up to the nose in order to smell them. It makes a GORGEOUS color pattern in the water if it’s a fresh one, as you can see in my photo below. 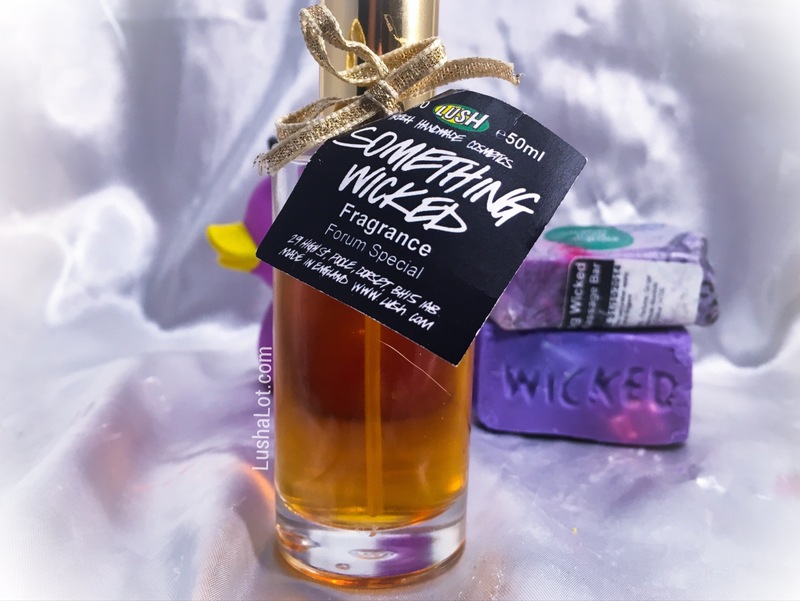 Lush UK also made a Something Wicked Lotion for forum members only in 2009 or 2010. It was SO good. My photo of the lotion below. Lush Times 2006 description: Possibly the Queen of our new bath melt selection. Ginger and jasmine envelope you in a sensual haze of soft, warm, welcoming swirls of glittery, moisturising foam. Wicked in every sense of the word. 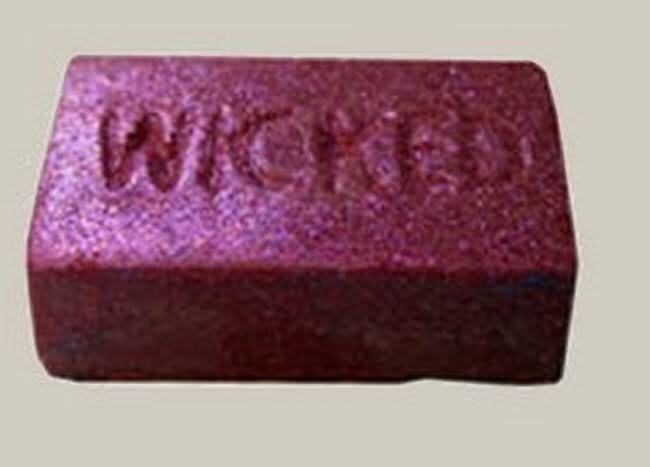 This is what the Something wicked melt looked like during halloween 2008, with a dark pink red glitter. Here’s an 8 second video showing my something wicked perfume.